For the Soviet-era warships, see Soviet cruiser Murmansk. Murmansk (Russian: Му́рманск, IPA: [ˈmurmənsk], Kildin Sami: Мурман ланнҍ Murman lannê) is a port city and the administrative center of Murmansk Oblast in the far northwest part of Russia. It sits on both slopes and banks of a modest ria or fjord, Kola Bay, an estuarine inlet of the Barents Sea. Its bulk is on the east bank of the inlet. It is in the north of the rounded Kola Peninsula which covers most of the oblast (semi-autonomous region). The city is 108 kilometres (67 mi) from the border with Norway and 182 kilometres (113 mi) from the Finnish border. The city is named for the Murman Coast, an archaic term in Russian for Norway. Benefitting from the North Atlantic Current, Murmansk resembles cities of its size across western Russia, with highway and railway access to the rest of Europe, and the northernmost trolleybus system on Earth. Its northern latitude of 68°58'N makes Murmansk 2° north of the Arctic Circle at approximately 66°33'N. Its connectivity contrasts to the isolation of Arctic ports like the Siberian Dikson on the shores of the Kara Sea and Iqaluit, Nunavut in Canada on Baffin Island's Frobisher Bay off the Labrador Sea. Despite long, snowy winters, Murmansk's climate is moderated by the generally ice-free waters around it. Although there was a building boom in the early twentieth century's arms races, Murmansk's population has been in a slow reversal since the Cold War; from 468,039 (1989 Census); 336,137 (2002 Census); 307,257 (2010 Census); to 299,148 (2014 estimate). It remains by far the largest city north of the Arctic Circle and is a major port on the Arctic Ocean. Murmansk was the last city founded in the Russian Empire. 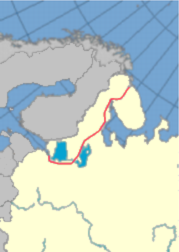 In 1915, World War I needs led to the construction of the railroad from Petrozavodsk to an ice-free location on the Murman Coast in the Russian Arctic, to which Russia's allies shipped military supplies. The terminus became known as the Murman station and soon boasted a port, a naval base, and an adjacent settlement with a population that quickly grew in size and soon surpassed the nearby towns of Alexandrovsk and Kola. On June 29 [O.S. July 12], 1916, Russian Transport Minister Alexander Trepov petitioned to grant urban status to the railway settlement. On July 6 [O.S. July 19], 1916, the petition was approved and the town was named Romanov-on-Murman (Рома́нов-на-Му́рмане, Romanov-na-Murmane), after the imperial Russian dynasty of Romanovs. On September 21 [O.S. October 4], 1916, the official ceremony was performed, and the date is now considered the official date of the city's foundation. After the February Revolution of 1917, on April 3 [O.S. April 16], 1917, the town was given its present name. In the winter of 1917 the British North Russia Squadron under Rear Admiral Thomas Kemp was established at Murmansk. From 1918 to 1920, during the Russian Civil War, the town was occupied by the Western powers, who had been allied in World War I, and by the White Army forces. On February 13, 1926, local self-government was organized in Murmansk for the first time, during a plenary session of the Murmansk City Soviet, which elected a Presidium. Before this, the city was governed by the authorities of Alexandrovsky Uyezd and later of Murmansk Governorate. On August 1, 1927, the All-Russian Central Executive Committee (VTsIK) issued two resolutions: "On the Establishment of Leningrad Oblast" and "On the Borders and Composition of the Okrugs of Leningrad Oblast", which transformed Murmansk Governorate into Murmansk Okrug within Leningrad Oblast and made Murmansk the administrative center of Murmansk Okrug. In 1934, the Murmansk Okrug Executive Committee developed a redistricting proposal, which included a plan to enlarge the city by merging the surrounding territories in the north, south, and west into Murmansk. While this plan was not confirmed by the Leningrad Oblast Executive Committee, in 1935–1937 several rural localities of Kolsky and Polyarny Districts were merged into Murmansk anyway. According to the Presidium of the Leningrad Oblast Executive Committee resolution of February 26, 1935, the administrative center of Polyarny District was moved from Polyarnoye to Sayda-Guba. However, the provisions of the resolution were not fully implemented, and due to military construction in Polyarnoye, the administrative center was instead moved to Murmansk in the beginning of 1935. In addition to being the administrative center of Murmansk Okrug, Murmansk continued to serve as the administrative center of Polyarny District until September 11, 1938. On February 10, 1938, when the VTsIK adopted a Resolution changing the administrative-territorial structure of Murmansk Okrug, the city of Murmansk became a separate administrative division of the okrug, equal in status to that of the districts. This status was retained when Murmansk Okrug was transformed into Murmansk Oblast on May 28, 1938. During World War II, Murmansk was a link to the Western world for the Soviet Union with large quantities of goods important to the respective military efforts traded with the Allies: primarily seeing military equipment, manufactured goods and raw materials brought into the Soviet Union. The supplies were brought to the city in the Arctic convoys. German forces in Finnish territory launched an offensive against the city in 1941 as part of Operation Silver Fox. Murmansk suffered extensive destruction, the magnitude of which was rivaled only by the destruction of Leningrad and Stalingrad. However, fierce Soviet resistance and harsh local weather conditions with the bad terrain prevented the Germans from capturing the city and cutting off the vital Karelian railway line and the ice-free harbor. For the rest of the war, Murmansk served as a transit point for weapons and other supplies entering the Soviet Union from other Allied nations. This unyielding, stoic resistance was commemorated at the 40th anniversary of the victory over the Germans in the formal designation of Murmansk as a Hero City on May 6, 1985. During the Cold War Murmansk was a center of Soviet submarine and icebreaker activity. After the dissolution of the Soviet Union, the nearby city and naval base of Severomorsk remains the headquarters of the Russian Northern Fleet. In 1974, a massive 35.5-meter (116 ft) tall statue Alyosha, depicting a Russian World War II soldier, was installed on a 7-meter (23 ft) high foundation. In 1984, the Hotel Arctic, now known as Azimut Hotel Murmansk, opened and became the tallest building above the Arctic Circle. On January 1, 2015, the territory of Murmansk was expanded, when the urban-type settlement of Roslyakovo, previously in jurisdiction of the closed administrative-territorial formation of Severomorsk, was abolished and its territory merged into Murmansk. Murmansk features a subarctic climate (Köppen Dfc), with long and cold winters and short, cool summers. In the city, freezing temperatures are routinely experienced from October to May. Average temperatures exceed 0 degrees Celsius only from May through October. The average low during the coldest part of the year in Murmansk is approximately −14 °C (7 °F). However, temperatures routinely plunge below −20 °C (−4 °F) during the winter. Murmansk's brief summer is mild, with average highs in July exceeding +17 °C (63 °F). The city is slightly wetter during the summer than the winter and receives an annual average of just under 500 mm (20 in) of precipitation. The "midnight sun" is above the horizon from 22 May to 23 July (63 days), and the period with continuous darkness lasts a bit shorter, polar night from 2 December to 10 January (40 days). Within the framework of administrative divisions, it is incorporated as the City of Murmansk—an administrative unit with the status equal to that of the districts. As a municipal division, the City of Murmansk is incorporated as Murmansk Urban Okrug. City districts were established in Murmansk for the first time by the Decree of the Presidium of the Supreme Soviet of the Russian SFSR of April 20, 1939; at the time, three city districts (Kirovsky, Leninsky, and Mikoyanovsky) were created. They were abolished on June 2, 1948. The same city districts were created for the second time on June 23, 1951. Mikoyanovsky City District was renamed Oktyabrsky on October 30, 1957, but on September 30, 1958, all three city districts were again abolished. On June 10, 1967, two city districts were created (Leninsky and Oktyabrsky); Pervomaysky City District was split from Oktyabrsky on February 21, 1975. In the Charter of the Hero City of Murmansk, adopted on December 17, 1995, the districts started to be referred to as administrative okrugs. The population of the city, according to the 2010 Census, was 307,257, of these, 141,130 men (45.9%) and 166,127 women (54.1%), down from 468,039 recorded in the 1989 Census. Ethnic Russians make up the majority of the population, but Ukrainian and Belarusian minorities also live in the city. In November 2010 direct mayoral election was abolished, and re-instituted in January 2014, with the most recent elections for mayor and city council taking place in September 2014. Murmansk has two main (and several small) museums: Murmansk Oblast Museum and Murmansk Oblast Art Museum. There are three professional theaters, libraries, and an aquarium in Murmansk. Murmansk is the venue of the decommissioned Lenin (1957 icebreaker) which is now a museum ship. Alyosha Monument, Murmansk or Defenders of the Soviet Arctic during the Great Patriotic War monument is also located in Murmansk. The main square of Murmansk is Five Corners, Murmansk. The city's association football team, FC Sever Murmansk, played in the Russian Second Division until 2014 when it folded due to financial difficulties. Bandy club Murman has played in the Russian Bandy Super League, last in 2011–2012. Between 2012 and 2018 they were playing in the second tier Russian Bandy Supreme League, but will from the 2018-19 season be a Super League team again. Their home arena Stadium Stroitel has an audience capacity of 5 000. The city is one of only three places with representation in the female league, through the team Arktika. To commemorate the 85th anniversary of the city's foundation, the snow-white church of the Savior-on-the-Waters was modeled after the White Monuments of Vladimir and Suzdal and built on the shore for the sailors of Murmansk. 15 religious associations have been registered in Murmansk. The largest is the Russian Orthodox Church, Murmansk is the center of its Murmansk and Monchegorsk diocese, as well as the Murmansk Metropolis. The city has about a dozen Orthodox churches, the department of the head of the diocese and the metropolis of Metropolitan Simon is located in St. Nicholas Cathedral. Murmansk's evening newspaper is Vecherniy Murmansk, published since 1991. The port of Murmansk remains ice-free year round due to the warm North Atlantic Current and is an important fishing and shipping destination. It is home port to Atomflot, the world's only fleet of nuclear-powered icebreakers. The Port of Murmansk is the headquarters of Sevmorput (Northern Sea Route) and the administration of Russian Arctic maritime transport. Murmansk is linked by the Kirov Railway to St. Petersburg and is linked to the rest of Russia by the M18 Kola Motorway. Murmansk Airport provides air links to Moscow and St. Petersburg, as well as an international connection to Tromsø, Norway. Buses and trolleybuses provide local transport. Murmansk is set to be the Russian terminus of the Arctic Bridge, a sea route linking it to the Canadian port of Churchill, Manitoba. Even though the passage has not been fully tested for commercial shipping yet, Russian interest in this project (along with the Northwest Passage) is substantial, as the bridge will serve as a major trade route between North America, Europe and Asia. Murmansk is home to Murmansk State Technical University, the Murmansk Arctic State University (formerly Murmansk State Pedagogical University), the Murmansk Institute of Humanities and the Murmansk College of Arts (the only Art School of the Kola Peninsula, formerly the 'Murmansk Music School'). The city has 86 primary schools and 56 secondary schools, two boarding schools, and three reform schools. ^ Stepanova, Anna (September 29, 2017). "День города в Мурманске 2017: программа праздника и перекрытия дорог". Komsomolskaya Pravda. Retrieved November 20, 2017. ^ "Top 10 largest cities within the Arctic Circle". ^ "Bolshevik, North Russian, Royal Navy, Expeditionary Force, Archangel, Dvina River". Naval-history.net. Retrieved December 8, 2010. ^ Hill, Alexander (2007). "British Lend Lease Aid and the Soviet War Effort, June 1941-June 1942". The Journal of Military History. 71 (3). JSTOR 30052890. ^ "Nature Administrative-territorial system". 2004.murman.ru. October 4, 1916. Retrieved May 5, 2009. ^ "Климат Мурманска" [The Climate of Murmansk]. Weather and Climate (Погода и климат) (in Russian). Retrieved August 31, 2016. ^ "Murmansk Climate Normals 1961–1990". National Oceanic and Atmospheric Administration. Retrieved February 12, 2016. ^ Статистический сборник Численность, размещение и возрастно-половой состав населения Мурманской области. Итоги Всероссийской переписи населения. Том 1. 2012 Archived 2012-12-22 at the Wayback Machine / Федеральная служба государственной статистики, Территориальный орган Федеральной службы государственной статистики по Мурманской области. Мурманск, 2012 — 75 с. ^ "Google Translate". translate.google.com. Retrieved July 3, 2017. ^ "Google Translate". Translate.google.se. Retrieved March 12, 2013. ^ "Религиозные объединения". Официальный портал Мурманской области. ^ "Храмы епархии". Сайт Мурманской и Мончегорской епархии. Archived from the original on June 17, 2012. Retrieved June 15, 2012. ^ "Культура, образование, наука, спорт, церковь". Администрация города Мурманска - официальный сайт. Archived from the original on June 17, 2012. Retrieved June 15, 2012. ^ "Atomflot – Bellona". Bellona. Archived from the original on July 16, 2011. Retrieved December 7, 2010. ^ "Chinese goods may come to US via Murmansk". Barentsnova. August 18, 2014. Archived from the original on September 12, 2014. ^ "Мурманский колледж искусств" [Murmansk College of Arts]. mki-51.ru (in Russian). Retrieved July 3, 2017. ^ "Groningen – Partner Cities". © 2008 Gemeente Groningen, Kreupelstraat 1,9712 HW Groningen. Archived from the original on September 26, 2007. Retrieved December 8, 2008. Мурманская областная Дума. Закон №96-01-ЗМО от 6 января 1998 г. «Об административно-территориальном устройстве Мурманской области», в ред. Закона №1953-01-ЗМО от 24 декабря 2015 г. «О внесении изменений в Закон Мурманской области "Об административно-территориальном устройстве Мурманской области"». Опубликован: "Мурманский Вестник", №10, стр. 3, 16 января 1998 г. (Murmansk Oblast Duma. Law #96-01-ZMO of January 6, 1998 On the Administrative-Territorial Structure of Murmansk Oblast, as amended by the Law #1953-01-ZMO of December 24, 2015 On Amending the Law of Murmansk Oblast "On the Administrative-Territorial Structure of Murmansk Oblast". ). Мурманская областная Дума. Закон №531-01-ЗМО от 2 декабря 2004 г. «О статусе муниципального образования город Мурманск». Вступил в силу 1 января 2005 г. Опубликован: "Мурманский Вестник", №234, стр. 3, 7 декабря 2004 г. (Murmansk Oblast Duma. Law #531-01-ZMO of December 2, 2004 On the Status of the Municipal Formation of the City of Murmansk. Effective as of January 1, 2005.). Совет депутатов города Мурманска. Решение №20-235 от 10 марта 2006 г. «Устав муниципального образования город Мурманск», в ред. Решения №15-202 от 4 февраля 2010 г «О внесении изменений в Устав муниципального образования город Мурманск, утверждённый Решением Совета Депутатов города Мурманска от 10.03.2006 (с изменениями и дополнениями от 31.05.2006 №23-263, от 05.10.2006 №24-298), с последующими изменениями, внесёнными Решениями Совета депутатов города Мурманска от 13.11.2007 №43-529, от 03.04.2008 №48-588 и от 03.06.2009 №5-57». Вступил в силу в соответствии со статьёй 81. Опубликован: "Вечерний Мурманск", спецвыпуск, стр. 1–12, 10 ноября 2006 г. (Council of Deputies of the City of Murmansk. Decision #20-235 of March 10, 2006 Charter of the Municipal Formation of the City of Murmansk, as amended by the Decision #15-202 of February 4, 2010 On Amending the Charter of the Municipal Formation of the City of Murmansk, Adopted by the Decision of the Council of Deputies of the City of Murmansk of March 10, 2006 (with the Amendments and Supplements #23-263 of May 31, 2006, #24-298 of October 5, 2006), with Subsequent Amendments, Introduced by the Decisions of the Council of Deputies of the City of Murmansk #43-529 of November 13, 2007, #48-588 of April 3, 2008, and #5-57 of June 3, 2009. Effective as of the day determined by the provisions of Article 81.). Мурманская областная Дума. Закон №1812-01-ЗМО от 19 декабря 2014 г. «Об упразднеии населённого пункта Мурманской области и о внесении изменений в отдельные законодательные акты Мурманской области». Вступил в силу 1 января 2015 г. Опубликован: "Мурманский Вестник", №246–247, с. 56, 25 декабря 2014 г. (Murmansk Oblast Duma. Law #1812-01-ZMO of December 19, 2014 On Abolishing an Inhabited Locality in Murmansk Oblast and on Amending Various Legislative Acts of Murmansk Oblast. Effective as of January 1, 2015.). Wikimedia Commons has media related to Murmansk.